MONTREAL -- The head of Canada's largest dairy processor is criticizing the federal government's stance on dairy quotas in the latest version of the Trans Pacific Partnership. Canada was overly generous in the revised TPP by agreeing to the same import quotas for imported cheese that were part of the deal before the United States withdrew last year, said Saputo Inc. chief executive Lino Saputo Jr. during a conference call about its third-quarter results. "My opinion is I think that Canada overshot." The trade deal involving 11 Pacific countries that's set to be signed next month allocates 3.25 per cent of Canada's supply-managed dairy sector or 14.5 million kilograms of cheese or cheese equivalent products to foreign competition. That's the same level included in the first TPP that was expected to be filled largely by American producers. Saputo (SAP.TO) said the new quota should have been prorated because the United States, with about 325 million people, is no longer involved. "It's not an agreement based on close to a billion people, it's an agreement based on 500 million people but you're giving the same quota allocation. To me the numbers don't make sense," he said in an interview. Saputo said if such access is maintained, Canada should let dairy producers and processors have total control over the products coming into the country. That would be different than during the Canada-Europe trade deal, which gave half the quota to retailers and distributors and half to farmers, processors and producers. "I just hope that government doesn't make the same mistake in TPP that they made in CETA with respect to quota allocations," he said. Saputo said retailers and distributors have no vested interest in the dairy space, adding that he will fight hard so that International Trade Minister Francois-Philippe Champagne "understands that this should go 100 per cent to the dairy industry -- producers and processors." He said increased volumes of dairy imported into Canada will put pressure on domestic dairy prices because Canadians can't consume the millions of imported kilos of cheese. Saputo conceded that may be good for consumers but would hurt dairy producers and processors. "If producers in Canada go bankrupt because they have to compete with imported product long-term I don't think that's good. Short-term it might be good, long-term I'm not sure that's good for the infrastructure of dairy in Canada." Lawrence MacAulay, minister of agriculture and agri-food, said in an email that the TPP agreement "will give the Canadian agricultural industry preferential access to all CPTPP countries and will provide new market access opportunities for a wide range of Canadian products, including meat, grains, pulses, maple syrup, wines and spirits, and processed food." "We remain committed to growing our agricultural exports to $75 billion by 2025, putting more money in the pockets of farmers, while strongly supporting our dairy, poultry and egg farmers," MacAulay said. As for NAFTA, Saputo said uncertainty remains regarding potential changes and expects negotiations will slow down before elections in Mexico and the United States. "Whatever happens, I remain convinced we'll adapt to any revised regulatory environment in North America or anywhere in the world we operate." he told analysts. 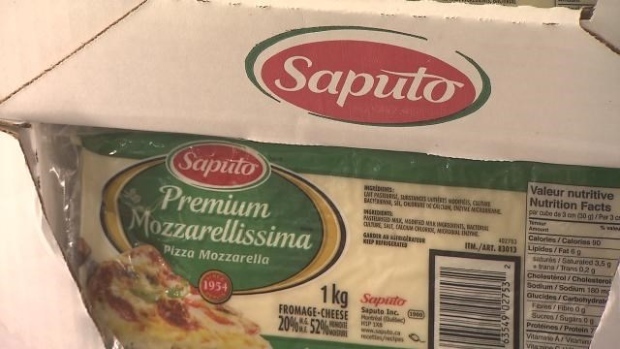 Saputo Inc. said it earned $337.0 million or 86 cents per diluted share in its latest quarter as it benefited from the corporate tax cuts in the United States. That compared with a profit of $197.4 million or 49 cents per diluted share a year earlier. Results for the three months ended Dec. 31 included a $178.9-million income tax benefit related to the reduction in the U.S. federal tax rate. Revenue totalled $3.02 billion, up from $2.97 billion in the same quarter a year earlier. On an adjusted basis, the company said it earned $183.2 million or 47 cents per diluted share, equal to analyst forecasts but down from an adjusted profit of $197.4 million or 49 cents per diluted share.